Alhaloub Cow, Valleys, Greenland, Lavache Creme, Queen, Teama. Almaraai serving United States and Canada. Halal food is our specialty product. Our services are a worldwide recognition, as a new benchmark for safety and quality assurance. Our services and commitment to providing the highest quality standards of Halal foods, has helped us to become a trusted household brand. 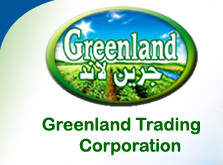 Established in 1997, Greenland Trading Corporation has grown in stature becoming one of the largest well-known Commercial Trade names for Halal food products. We have our own team of National distributors and local Retailers throughout the United States and Canada. With the popular demands of a diverse and larger variety of Halal foods, Greenland Trading Corporation was able to produce and incorporate a wide variety of Halal products into our successful line of products. We are committed to excellence in customer's service and consumer value through the effort of a highly motivated and responsible Team resulting in consistent and predictable growth. Our company is distinguishing quality and at suitable prices satisfying all the needs. For our consumers' needs we offer a wide range of impressive canned meat products made from the finest Halal slaughtered meat. We offer a wide range of canned corned beef, luncheon meat, butter ghee, samina, dairy product, frozen poultry, pickled vegetables, finest mejdool dates, tahina, and beans. Our successful line of products include and are not limited to butter ghee, Halal canned meat, different variety of imported cheeses, dates, pickled and frozen vegetables, fruit juice, spices, seeds, herbs, beans, oils, teas, coffee, grains, rice, halal poultry, cookies, candy, molasses, and sweets. Since we have been serving, people have purchased and trusted in choosing our products over our competition. With distinguished quality at a suitable price, Greenland Trading is able to remain a successful corporation. With our company being the only to produce a wide variety of high quality Halal products, we are able to satisfy our consumer needs. Overall, our products and services are consumer friendly that is what makes us unique. We take pride in bringing you good old tastes from back home.